David Brainerd was born April 20, 1718, at Hatham, Connecticut. His early years were spent in an atmosphere of piety though his father died when David was nine and his mother died five years later. As a young man he was inclined to be melancholy, with the welfare of his soul ever before him. His entire youth was divided between farming, reading the Bible, and praying. Early in life, he felt the call to the ministry and looked forward almost impatiently to the day when he could preach the Gospel. His formal education consisted of three years at Yale, where he was an excellent student until ill health forced him to return home. He completed his studies privately until he was fitted and licensed to preach by the Association of Ministers in Fairfield County, Connecticut. 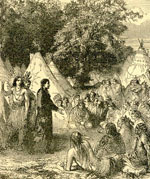 He turned down the offers of two pastorates in order to preach the Gospel to the American Indians. Jonathan Edwards wrote of him, "And, having put his hand to the plow, he looked not back, and gave himself, heart, soul, and mind, and strength, to his chosen mission with unfaltering purpose, with apostolic zeal, with a heroic faith that feared no danger and surmounted every obstacle, and with an earnestness of mind that wrought wonders on savage lives and whole communities." Brainerd did his greatest work by prayer. He was in the depths of the forests alone, unable to speak the language of the Indians. But he spent whole days in prayer, praying simply that the power of the Holy Ghost might come upon him so greatly that the Indians would not be able to refuse the Gospel message. Once he preached through a drunken interpreter, a man so intoxicated that he could hardly stand up. Yet scores were converted through that sermon. Plagued by ill health and the hardships of the primitive conditions, he died at the early age of twenty-nine, at the home of Jonathan Edwards, to whose daughter he was engaged. After his death, William Carey read his diary and went to India. Robert McCheyne read it and went to the Jews. Henry Martyn read it and went to India. Though it was not written for publication, his diary influenced hundreds to yearn for the deeper life of prayer and communion with God, and also moved scores of men to surrender for missionary work.